Dance teachers are the foundation of the dance world. Not only do they teach young people to enjoy movement and hone their technique, but they inspire, encourage, and for many, ignite a lifelong passion for dance. Though their work in the studio often goes unrecognized, they are the ones who give students—the performers and choreographers of tomorrow’s stages—the tools to succeed in dance. And if dance teachers are the foundation of the dance world, Anne Green Gilbert is certainly a cornerstone. A teacher of prodigious vision, she has done more than just run a successful school and dance company for the past 33 years: Gilbert has pioneered new teaching methods, established state-wide dance organizations, received national dance teaching honors, mentored dance teachers from around the world through her Summer Dance Institute for Teachers, and, perhaps most importantly, touched countless lives with her passion for dance. After 33 years as the director of The Creative Dance Center and Kaleidoscope Dance Company, Gilbert is stepping down and handing the reins to Terry Goetz, who will lead the school, and Anna Mansbridge, who will lead the company. Though she’ll still be active as a teacher at CDC, this weekend’s program of Kaleidoscope in Concert at Broadway Performance Hall marks the company’s final performance under Gilbert’s direction. The transition is a natural progression, but it still feels like the end of an era. Gilbert speaks humbly and matter-of-factly about stepping down (and most things in life, for that matter). “I never worried about a legacy. I’m like ‘Ok, when I’m ready to quit, it’s done. It is what it is.’” Intentional or not, Gilbert has certainly left an enduring legacy in the company and the school. And since she insists on not making a fuss over her retirement, what better way to celebrate her work than by watching it in action this weekend (May 9-11, 2014) at Kaleidoscope in Concert? The two fundamentals that set Gilbert’s methods apart from traditional dance teaching approaches are the BrainDance (a series of eight exercises that engage our natural developmental pathways) and a five-part lesson plan that alternates between teacher-directed and student-centered activities. “No matter what age, style, genre, level, we’re doing a combination of technique and improv. We don’t just teach technique.” Gilbert insists that this interplay between guided instruction and improvisation is what produces such unique dancers. It’s easy to see the correlation. In a recent rehearsal, the students moved assertively, their steps imbued with the enthusiasm of their youth and a powerful confidence that extended beyond their years. 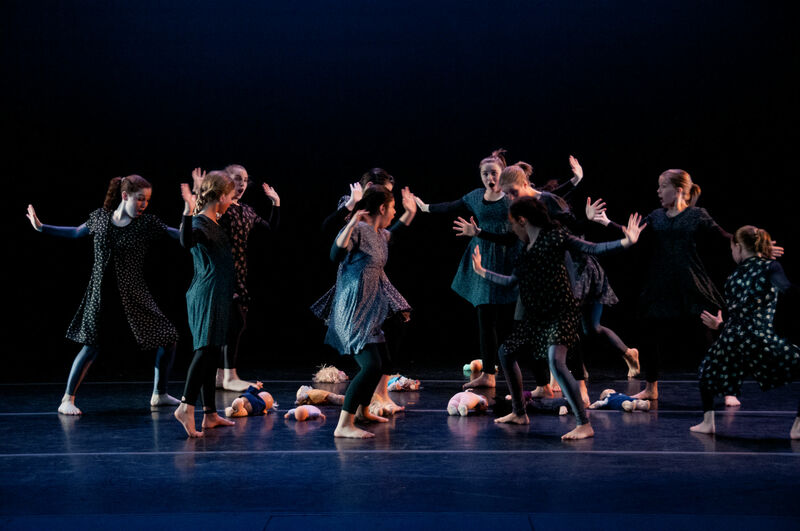 Gilbert’s focus on improvisation in class also taps directly into the student’s own choreographic potential, and the company serves as a whole fleet of choreographers-in-training. In every class, students compose their own movement studies, either individually or with others, which creates a comfort level with composition not often seen at such young ages. “They make up studies every week, [so] when it comes to making up a dance, they have all the tools, and they’ve been doing it since they were five years old. So they’re just so sophisticated.” They showcase their efforts every year in Kaleidoscope’s winter concert which consists exclusively of student choreography. Frustration aside, Gilbert knows that she’s had an incredibly fortunate and varied career. “I love all the branches [of my career]. I’m so lucky because I’ve been able to choreograph and have a dance company. I love that. I love training teachers, I love just teaching. I’ve been really blessed to just do what I want to do.” And while it’s hard to narrow down the highlights of such a long and fruitful career, Gilbert counted her travel experiences with Kaleidoscope and the wonderful relationships she’s forged with students, teachers, parents, and colleagues along the way at the top of the list. “Because dance is so powerful—particularly the way we teach it which is so collaborative—you make good friendships. It’s quite personal.” This is especially true with the company dancers she develops long term relationships with while watching them grow up. “If you have an adult company, they don’t change that much. These kids, they start at age 7, and then they completely change, and then they go to college and I’m still in touch with them.” The children clearly cherish the experiences and mentorship Gilbert provides as well. She still receives emails from former students now scattered across the globe who continue to develop the connections and friendships they started while in Kaleidoscope and who credit their time in the company for their lifelong passion for dance and the arts. To watch this passion being actively ignited, go see Kaleidoscope in Concert this weekend. For her final program as the helm of the company, Gilbert has curated a diverse show featuring everything from classical modern to swing dance. 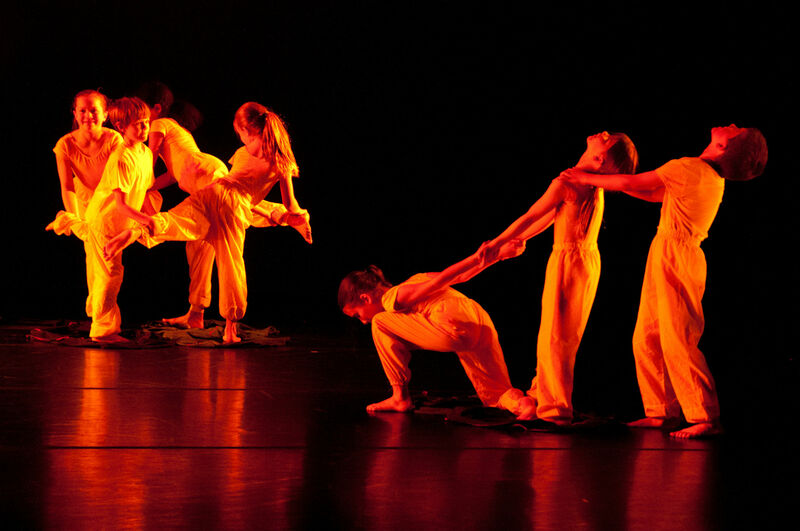 The choreography incorporates visual art work, humor, and, most of all, the children’s earnest enthusiasm and charisma. Only time will tell if any of these kids will continue on in dance, but, for now, they’re dancing their hearts out with impressive professionalism and confidence. That alone is a legacy worth celebrating. More information about the Creative Dance Center and Kaleidoscope Dance Company can be found at their website. Tickets to Kaleidoscope in Concert can be purchased here. Nicely done, best article about Anne I’ve seen in a long time. As a dance professor who has reaped the benefits of her excellent summer institute for teachers, and as a fan of Kaleidoscope, I thank you for shining the spotlight on Ms. Gilbert. She truly imbues lasting power of change on every student she teaches. And you highlighted the most important influence of all: that her methods and her love of teaching empower beyond the dance training, translating into life skills for creativity and personal success. She’s a Puget Sound treasure that the world comes here to experience. Thanks for this perfect piece!